Though today we often consider churches and their carillons as disturbances to our well-deserved sleep, they were formerly used by cities to display grandiosity and importance. In this sequel of the Sampling Stories we trace the history of the bells of the biggest church in Rotterdam, the Grote of Sint-Laurenskerk. Its bell sounds play an important role in the tracks of the compilation 010 (Fog Mountain Records 2016), released by RE:VIVE, an initiative from the Netherlands Institute for Sound and Vision that aims to bring together archives and artists to create new music out of and inspired by curated sets of archival material. While RE:VIVE's Gregory Markus unfolds the history of the church, Norient invited the artists from the compilation to tell us about their sampling strategies when processing bell sounds from the church in question. On May 14, 1940, the city of Rotterdam was devastated. A thriving medieval metropolis that served as the key entry point for the rest of the world seeking to enter Europe was reduced to rubble. By the numbers, 25,000 homes, 2,500 stores, 775 warehouses, 65 schools were destroyed and somewhere between 700 and 900 people lost their lives. This event has gone on to define their city. Its looming futuristic sky-line, modern architectural marvels, juxtaposed with post-war concrete blocks (and a sliver of remaining medieval houses) make Rotterdam feel more like a second-class American urban area – like Cleveland or Des Moines – than a Dutch city. For RE:VIVE, once we did our Damrak compilation where every track was inspired by Amsterdam and composed out of archival sounds made in the city we knew that Rotterdam had to be next because we needed to hear how artists would interpret the Netherlands «second city». Damrak raised eyebrows since it didn’t sound like canal houses and tech-house, it was clear from the sounds and images that there was more to the city than what draws millions to it each year. Damrak exposed obfuscated aspects of Amsterdam’s history. We hoped then that with 010 and the shift to Rotterdam, instead of exploring the hidden parts of the city we’d celebrate the obvious this time: ship horns, port mechanics, industrial constructions with hints of hope, struggle, and progress. The archival sounds in the sample pack (from the large treasures of the The Netherlands Institute for Sound and Vision; access full sample pack for 010 here) didn’t lend themselves to melody. The most prominent sounds were the Port of Rotterdam’s rhythmic churning sounds, incredible ship horns, and church bells. Specifically, the bells of the St. Laurenskerk which would go on to bookend of the compilation, solemnly introducing and majestically concluding the journey. The Grote of Sint-Laurenskerk of Rotterdam after the air raid of May 1940. The Grote of Sint-Laurenskerk is a Protestant church built between 1449 and 1525. Originally it was a Roman Catholic church, but during the Reformation of 1572, it was converted to Protestant. The structure is the last remaining relic of the gothic, medieval Rotterdam, and it looks severely out of place in the current city center. To an unknowing eye one would think the church came later almost like Saint Patrick’s Cathedral in New York City. However, one could argue the church did come later. 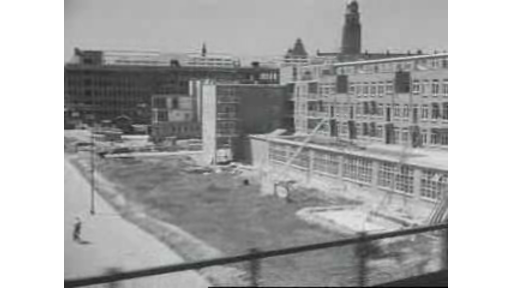 Following the Rotterdam Blitz on May 14, 1940 the church barely remained with just the walls and tower left standing. It’s important to note that there’s a historical belief that Rotterdam almost wasn’t bombed – that the bombing was perhaps an accident because the Dutch army had surrendered or sought to extended negotiations. What makes the story of the St. Laurenskerk special is not just the cliché about Rotterdam as a «phoenix» but more specifically, its bells. Church bells are a sound that dominate almost every European city. Millions of people flock to main squares simply to hear church bells ring out. They echo across small towns and landscapes and, more often than not for the unlucky few living next to them, are an early morning wake-up call. To an untrained ear, bells might just sound like the clangy clang of massive metal objects. In reality, their nuance and tonal capacity is an elegant, mathematical mystery of early sound design perfected by two Frenchmen in the Low Countries nearly 400 years ago. The story goes that on August 23, 1638, Descartes wrote to a colleague named Marin Mersenne and proclaimed, «In Utrecht lives a blind man with a great musical reputation, who regularly plays bells. I have seen how he elicits five or six different sounds on each of the largest bells without touching them, but only by coming close to their sound rim with his mouth». This gentleman was named Jacob van Eyck and indeed was blind but had tremendous hearing capacity. Van Eyck was a carillon virtuoso who mastered the long standing yet elusive theory among carillonneurs that bell sounds are «partial notes consisted of three notes an octave apart, supplemented by a minor third and a pure fifth in the second octave». However, to realize his theory he needed experts to make the actual bells. Enter Pierre and François Hemony, French brothers and carillon makers that had recently moved to the Low Countries. François and Pierre were born in France in 1609 and 1619, respectively, but relocated to the Rhineland in 1640. It was there that the brothers’ career took off. After a commission for the Dutch town, Goor, they were awarded a commission by the town of Zutphen for the new Winery Tower and moved there to open their foundry. In 1644 the two delivered their product. The bells, presumably done under consultation from Van Eyck, were the most well tuned and crafted bells in the area. They’re believed by some to be the first perfectly tuned carillon but no one can hear them anymore: in 1920 the tower burned down taking the bells with it. It was a perfect storm of circumstances for the Hemony brothers who set themselves apart with the Winery Tower and a new set of carillon done under consultation with Van Eyck for the town of Deventer. A year later in 1648 the peace of Munster was signed and the Dutch Republic was awarded sovereignty. At the time, cities used churches and their carillon to display grandiosity and importance. With an urge to raise their profile, the newly sovereign Dutch cities sought to celebrate by having the most perfect and lush carillion throughout Europe, distinguishing themselves from their former rulers. For Pierre and Francois, this meant that business was good. Together and individually, the brothers delivered 50 carillon throughout Belgium, the Netherlands, Germany, and Sweden. Under the initial guidance of the blind Van Eyck, they turned the carillon into a viable musical instrument. There were doubts after the brothers’ deaths that no one would be able to match their level of mastery. For centuries after, new bell makers would be compared to the Hemony standard. Access full sample pack for 010 here (Creative Commons BY-SA license). The immense history and legacy that exists in these towers is something that’s not often considered by the general population. The idea that the equivalent of a Stradivarius, which rings out and reverberates for miles every day (like the urban legend of a famed violinist playing a free concert disguised as a busker for busy commuters) is something we take for granted. We hear what we hear and see what we see but don’t recognize the greatness behind it simply because no one is there to tell us it’s great. For Rotterdam, it seems almost too serendipitous that the Laurenskerk remained after the bombing. While the vast majority of the church had burned out, most of the Hemony carillon remained intact because of a recently poured concrete floor in the tower. For 010 the Laurenskerk played a huge sonic role because it offered clear melodic frequencies and with warm tails and drones. We chose to use it as both the intro and closing for the compilation as a way to signify a start and end, warm prologue and epilogue for what is otherwise a rather rough ride. Rotterdam begs for metaphors and cliches like this. And while for the normal person the Hemony bells in the Laurenskerk will ring out unacknowledged, a few will listen and think how lucky it is to be hearing the last fleeting sonic remnants of a city that once was. So the bells will ring on for the time being and signify each new day as Rotterdam pushes on. «It was not the specific church that drew me in, I didn’t find the name of the church until later. It is just the nature of the bells and the effect they have on me in various cities around the world. There is something in the nature of church bells that helps you widen your perspective on a city. This is a combination of the way that the sound travels and cuts through the wall of noise and also in their purpose, calling to you. Often, because the environment is built up, it is hard to look beyond your current position in a city, but church bells pull you into a larger perspective. More about Roly Porter on his Website, Twitter or SoundCloud. «For me, and I would assume many people, church bells possess a spiritual aura and express a unique religious emotion or something of greater power – even enlightenment. They also have their negative connotations but the Sint Laurenskerk bells sounded powerful and uplifting. I’ve always wanted to bring these concepts to my own music and the Sint Laurenskerk bells were quite valuable to my contribution to the compilation. When I was creating my track, ‹Eva›, I knew I wanted to use the bells for a melody to bring emotion to the dense industrial sounds I’d been working with. The bells were the best option to create some tones with. Adding these tones boosted the track to the «greater power» it needed. The track no longer sounded like it was just a machine, it had become a machine with divine power. More about Meta on Twitter or SoundCloud. More about Oaktree on his Website, Twitter, Facebook or SoundCloud. More about BZGRL on Instagram, Twitter, Facebook or SoundCloud. 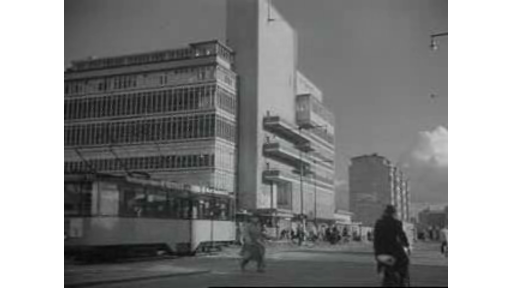 Film by Herman van der Horst about the reconstruction of the city centre of Rotterdam after World War II on St. Laurenskerk. Luc Rombouts: Singing Bronze: A History of Carillon Music, Leuven: Leuven University Press, 2014. This article has been published in the context of the PhD research on sampling in experimental electronic music by Hannes Liechti. For more info click here.